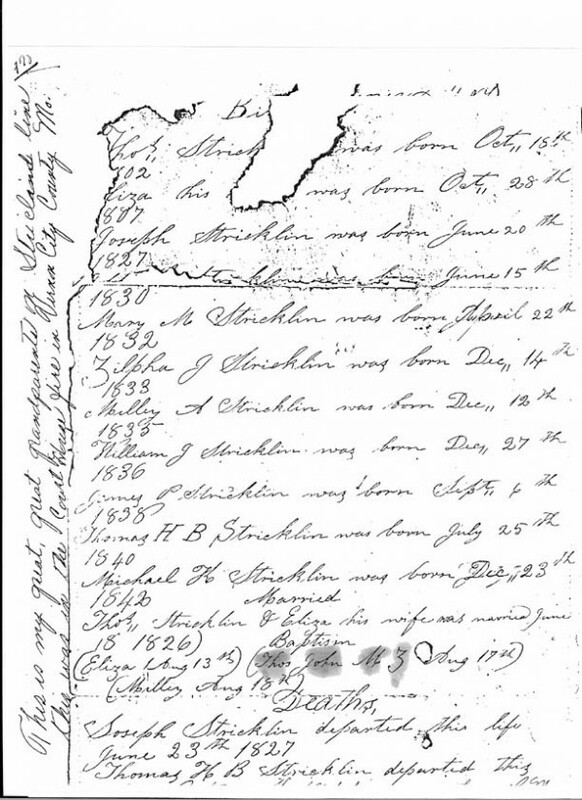 This family record of Thomas Strickland and Elizabeth Shock is courtesy of Judy Berndt. As noted in the margin, it survived the Vernon County, Missouri courthouse fire. Thos. Stricklin was born Oct. 15th 1802. Eliza his wife was born Oct 28th 1807. Joseph Stricklin was born June 20th 1827. Mary M. Stricklin was born April 22 1832. Zilpha J. Stricklin was born Dec. 14th 1833. Milly A. Stricklin was born Dec. 12th 1835. William J. Stricklin was born Dec. 27th 1836. James P. Stricklin was born Sept. 6th 1838. Thomas H. B. Stricklin was born July 25th 1840. 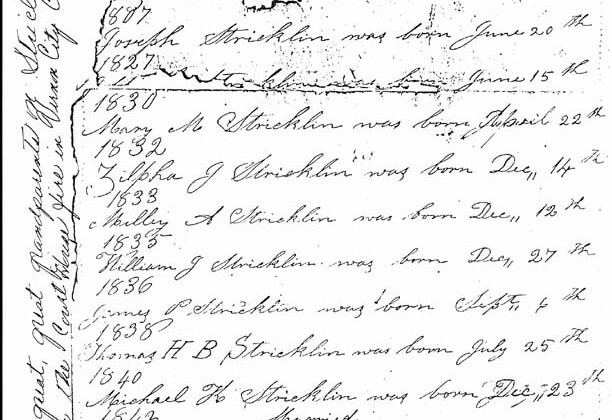 Michael K. Stricklin was born Dec. 23 1842. Thos. Stricklin and Eliza his wife was married June 18 1826. Joseph Stricklin departed this life June 23 1827.